For players in China, games like Pokemon Go are a scarcity, thanks to the country’s long-standing ban on Google. As a result, Tencent has launched its own take on the game, while combining it with the collectable game CryptoKitties. 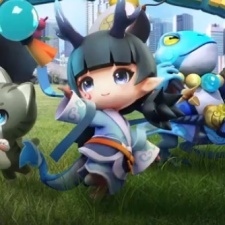 Launched on China’s dedicated iOS app store, the AR-title ‘Let’s Hunt Monsters’ makes use of Tencent’s own blockchain solution. Meaning users can explore and capture various monsters while earning virtual tokens in the process. The development team managed to obtain a license for in-game purchases before China began its clampdown on game developers. Interestingly, this will be one of the first games from Tencent which makes use of the BCOS ‘coinless’ blockchain solution, which was announced in October last year. This blockchain ecosystem operates less as a single chain, and more like a series of blockchain applications. BlockchainGamer.biz has the full story. You can gain more insights into the Asia markets on the East Meets West track at Pocket Gamer Connects Seattle, which takes place on May 13th to 14th. PGC will be heading to Hong Kong on July 17th to 18th.